Jeffery Deaver. Photo by Garry Knight. Jeffery Deaver has 1 media appearance. MysteryPeople is thrilled to welcome Jeffery Deaver back to BookPeople, this time to share his new thriller, Solitude Creek. #1 international bestselling author of over 30 novels and sold in over 150 countries. In Solitude Creek, a tragedy occurs at a small concert venue on the Monterey Peninsula. Cries of "fire" are raised and, panicked, people run for the doors, only to find them blocked. A half dozen people die and others are seriously injured. But it's the panic and the stampede that killed; there was no fire. Kathryn Dance--a brilliant California Bureau of Investigation agent and body language expert--discovers that the stampede was caused intentionally and that the perpetrator, a man obsessed with turning people's own fears and greed into weapons, has more attacks planned. She and her team must race against the clock to find where he will strike next before more innocents die. Jeffery Deaver is an American mystery/crime writer. He has been awarded the Steel Dagger and Short Story Dagger from the British Crime Writers' Association and the Nero Wolfe Award, and he is a three-time recipient of the Ellery Queen Reader's Award for Best Short Story of the Year and a winner of the British Thumping Good Read Award. His novels have appeared on bestseller lists around the world, including The New York Times, The Times, Italy's Corriere della Sera, The Sydney Morning Herald, and The Los Angeles Times. Can't make it to the event? You can order a signed, personalized copy of this book. We ship worldwide. Simply write "SIGNED COPY" and the name for the personalizations in the Comments field during checkout. Thank you for supproting Jeffery Deaver and your local independent bookstore! The World Mystery Convention is a nonprofit, all-volunteer organization which holds an annual convention in honor of Anthony Boucher, the distinguished mystery fiction critic, editor and author. It is the world's premier event bringing together all parts of the mystery and crime fiction community, and is commonly referred to as Bouchercon. Further details about this event are to follow. Jeffery Deaver will sign and discuss The skin collector (Grand Central; $28.00), which is the sequel to The Bone Collector! Jeffery Deaver’s most recent #1 international bestseller is Carte Blanche, the new James Bond novel that brought Ian Fleming’s Agent 007 firmly into the modern age. After revealing his lifelong admiration for Fleming’s novels while accepting the Crime Writer’s Association Ian Fleming Steel Dagger Award for his thriller Garden of Beasts, Deaver was approached by the estate of Ian Fleming to write the next Bond thriller. It debuted on bestseller lists around the world. The author of two collections of short stories and 28 previous suspense novels, Deaver is best known for his Kathryn Dance and Lincoln Rhyme thrillers, most notably The Bone Collector, which was made into a feature starring Denzel Washington and Angelina Jolie. His many awards include the Novel of the Year at the International Thriller Writers’ Awards in 2009 for his standalone novel The Bodies Left Behind. The latest entries in the Lincoln Rhyme series are The Cold Moon, The Broken Window, and The Burning Wire. Deaver has been nominated for seven Edgar Awards by the Mystery Writers of America, an Anthony Award and a Gumshoe Award. He was recently short-listed for the ITV3 Crime Thriller Award for Best International Author. His books are sold in 150 countries and translated into 25 languages. He lives in North Carolina. Talk & Book Signing with Best Selling author Jeffrey Deaver for The October List Jeffery Deaver has created the most riveting and original novel of the year: a race-against-the-clock mystery, told in reverse. Two days ago, Gabriela’s life was normal. Then, out of the blue, she gets word that her six-year-old daughter has been taken. She’s given an ultimatum: pay half a million dollars and find a mysterious document known as the “October List” within 30 hours, or she’ll never see her child again. Jeffery Deaver, The Devil's Teardrop. ; Karin Slaughter, Blindsighted. Jeffrey Deaver reads from Carte Blanche. Jeffery Deaver signs The Burning Wire. 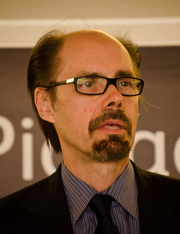 Jeffery Deaver (born May 6, 1950) is an American mystery/crime writer. He has a bachelor of journalism degree from the University of Missouri and a law degree from Fordham University and originally started working as a journalist. He later practiced law before embarking on a successful career as a best-selling novelist. Jeffery Deaver's book Manhattan Mayhem was available from LibraryThing Early Reviewers. Jeffery Deaver's book USA Noir was available from LibraryThing Early Reviewers. Jeffery Deaver's book Manhattan Mayhem was available from LibraryThing Member Giveaway. Jeffery Deaver is currently considered a "single author." If one or more works are by a distinct, homonymous authors, go ahead and split the author. Jeffery Deaver is composed of 26 names. You can examine and separate out names.